Help! You have encountered some issues on our website or in our App. How can we support you? In order to help you as well as possible, we need some specific information. The more details, the faster we can resolve the issue. What device are you using? Like a Samsung A5 or an iPhone 6. Did you see an error message? That’s not always the case. Where you encountered the issue? Like when you purchase the App, or in the Daily program. If you don’t have a specific issue or you want to provide us with some feedback, don’t hesitate, and just send us an email. CRF is characterized by feelings of tiredness, weakness and a lack of energy related to cancer or cancer therapy. CRF impacts daily living and reduces the quality of life with social and economic consequences. Many physical problems can become intertwined with psychological factors. People become worried, desolated, stressed, pessimistic, etc. In fact, these factors can sustain the fatigue or even make it worse. Untire offers a step-by-step approach to reducing CRF and addresses all factors that may contribute to the issue. What is the science behind Untire? 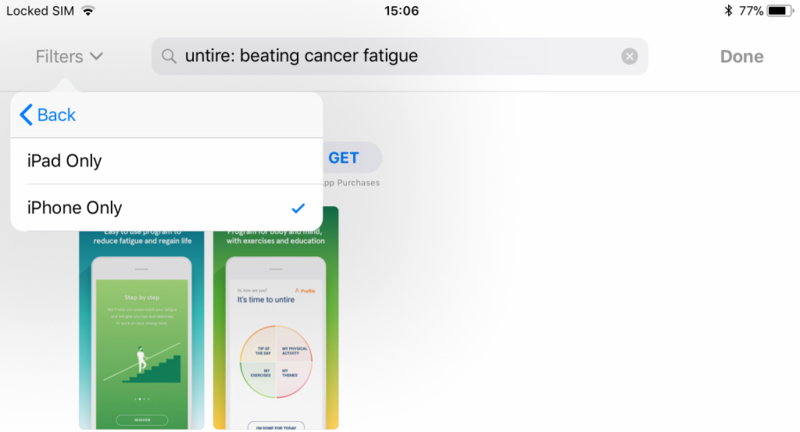 The Untire App is based on many years of experience in face-to-face group therapy and online therapy with hundreds of (former) cancer patients suffering from extreme fatigue. We use theories and techniques from scientifically proven cognitive behavior therapy, mindfulness-based cognitive therapy, positive psychology and physical exercise interventions. Scientific research has shown that the results of these treatments are extremely good. Untire is an easy to use step-by-step program that starts with a basic introduction to the various elements of the program. After completing the Basics, you will fill in a weekly evaluation as to how you are doing. After that, you enter a program that you can follow daily. This program consists of four main elements: stress-reduction exercises, a physical activity program, educational topics (Fatigue, Anxiety, Worry, Boundaries, Sleep, Self-Care and Nutrition) and daily tips. You set the pace. You can always decide in what order you want to go through the elements. You can also decide how often and how long you want to use the Untire app, because you’re the only one who can evaluate your progress. Do you have evidence regarding its effectiveness? Untire is based on successful and scientifically proven interventions (see What is the science behind Untire). With Untire we are confident that it will help to reduce fatigue. The University of Groningen (the Netherlands) will conduct a large randomized controlled study into the effectiveness of Untire throughout 2018 and 2019 in different countries with permission from national Medical Ethical Commissions. It may take some time (weeks) before any positive results can be noticed. So, try to keep going and use the app’s education, exercises and tips regularly because the more you practice the more likely you are to see results. We advise you to consult your doctor before using the app to treat medical causes of the fatigue, if that is the case. If you suffer from serious psychological problems (e.g. depression, psychosis), then those problems must be addressed first. Is there any harm in trying it? There is no indication that using Untire is harmful under any circumstance. Approximately 1-4% of all people may feel more tired in the beginning because they become more aware of their feelings, behavior and body. That disappears after they have been using the app for a while. Did you develop Untire in consultation with cancer patients? Yes, we did. Cancer patients and cancer survivors were involved in designing and testing Untire. I have a good idea for Untire. How can I get in touch with you? Can Untire be useful for all cancer patients and cancer survivors, regardless of cancer prognosis, phase, treatment or age? Yes, we believe it can be. We know that in general the effect of psychological support and physical activity might be greater after the first period of the disease and/or treatments. During the first period of the diagnosis and the medical treatments, you put a lot of energy into adjusting to the new conditions. Can Untire be useful for people who are fatigued but do not have cancer? Untire was especially made for cancer patients and survivors. It might be helpful for other people as well. Can Untire be used by more than one person at a time? Untire is meant to be your personal program. You create a personal account, with your own measurements and your own (private) notes. We advise you to use your account only for yourself. Which devices can I use Untire with? You need a smartphone or a tablet in order to use Untire. Unfortunately, a desktop computer version is not available. Our app works on Android and iOS (Apple). For iOS users: at this time we only have an iPhone version of the Untire App. If you are using iPad you will need to select a specific filter in iTunes: “iPhone Only”. You can find this filter on the left side of the iTunes search bar. Without turning on this filter you will not be able find the Untire App in the iTunes store. Can I use Untire if I don’t use my smartphone a lot? Is Untire suitable for teens? I have difficulty reading, is there an audio option? Yes, we have built an audio option into many parts of the Untire app. Especially for the longer texts. Short texts will not have an audio option. What about my data, is Untire secure? Let’s start to mentoir, privacy matters! We collect your data with two goals; (1) to give you the best experience and (2) to use the data for internal research how to improve our cancer-related fatigue program. – Device identifiers and Technical information pertaining your device – to enable access to multiple devices. All other information, which is not related to any personal data, will only be used for internal research purposes. We store your data locally on your phone and in a secure data center for backup purposes. Your data will not be sold to third parties, or make it available to them for other purposes than to enable your use of the app. Development, storage, and backup services are outsourced by us to a third party service provider. You can access, correct and delete your data at any time in the app itself. We delete your account after 1 year of not using the App, you will be notified after 11 months. We implement appropriate technical and organizational measures and procedures in such a way that ensures the protection of your rights, and always in accordance with applicable data protection law. In case of a security breach, we will always inform you of the breach without undue delay, including a summary description of the potential impact and a recommendation on measures to mitigate the possible adverse effects of the breach. How often is new content added to the Untire daily program? We aim to update our content on a regular basis. All content will be based on the latest insights, scientific research, new technical features, etc. Which platforms can I use to access Untire? The Untire app is built for IOS and Android smartphones. Can I access Untire on multiple smartphones? Yes, you can. You just have to login. However, you cannot interchange between IOS and Android smartphones. How can I invite a Buddy? You have the option to invite a Buddy through Profile, under “Invite a Buddy”. With an easy tab on ‘share invite’ you can share a pre-set invite with anyone by any channel, such as WhatsApp, Facebook, e-mail, etc. Of course, you can adjust this pre-set message in any way you like. How do I repeat the exercises? You can always repeat an exercise you did once. You create your own exercise library in your profile screen. Go to the ‘exercise library’ and click your preferred exercise. It should start automatically. When do I get Milestones? You can achieve Milestones at different points when using the app. For example, when you finish a theme. If you use the App every day, for a longer period, you will be rewarded with more milestones. When? That will be a little surprise 😊. Is Untire available in other languages? At this moment, Untire is only available in English and Dutch. There are plans to add new languages in 2019. Can I use Untire offline? Any time you start a part of the program or start a theme, all audio and video files are automatically downloaded to your device. This ensures that you can listen or watch the exercises anywhere and at any time. To use Untire offline, you need to download all files in advance. You can do this for example before going on vacation. You have the option to download our full library (or parts) of audio and video files via Settings in the app, under Downloads manager. You can easily download and delete specific themes, exercises, daily programs or animations. Download only via Wi-Fi, otherwise data charges may occur. What settings can I change? There are certain features you cannot turn off, such as e-mail notifications regarding your account and billing. How do I update the name, e-mail address or password on my account? How do I unsubscribe from e-mail communications? At the moment we only send you billing or account-related e-mail communications. We are unable to disable these. How to turn on/off notifications? Go to Apple menu and select system preferences, then click notifications. Select Untire and you can manage the App’s notifications. Go to your phone settings and select notifications. Select Untire and you can manage the App’s notifications. Yes, within the Untire app you can download content such as audio and video files. You have the option to download our full library (or parts) of audio and video files via Settings in the app, under Downloads manager. Download only via Wi-Fi, otherwise data charges may occur. Can I delete audio / animation / theme / exercise files I no longer use? You can delete audio, animations, themes or exercises from Settings in the App. In Settings, go to Downloads manager. In Downloads manager, tap on the cross to delete specific files. Once deleted, those files will be automatically re-downloaded the next time you use them. How do I permanently delete all my personal information? If you want to delete your account permanently, we will erase all personal data such as your name, e-mail address and personal notes. In settings, select ‘Settings’. Click on ‘Forget me’ and confirm with your password. After permanent deletion, you will be automatically logged out and you can uninstall Untire. How to download my personal information? In Settings, select ‘Settings’. Click on ‘Download my personal data’. You’ll be taken to our web portal where you can download exports of your personal data. We will ask you to login using your e-mail address and password. The export is in a .csv format, a format that you can open in Microsoft Excel, for example. I do not hear any sound. Why is that? Please check that you have turned on the volume on your phone/tablet. How do I update the Untire App? Search for the Untire App in the App Store on your iPhone. Once you locate the app, tap the “Update” button on the right side to download the latest version. You will see the Untire icon on your phone turn grey, and a circle will appear showing the download/install progress. Once it is complete, tap the Untire icon to see the latest Untire version. Tap Menu, then My apps & games. Tap ‘Update All’ to update all apps. For individual apps, find the specific app you want to update (in this case Untire) and tap Update. Where can I go for more help? How do I contact Customer Support? We will try our very best to respond as soon as possible. Our aim is to respond within 24 hours. I have an issue, what do I do? You have encountered some issues on our website or in our App. In order to help you as best we can we need some specific information. The more details you give, the faster we can resolve the issue. Can you provide us with the following please? What device are you using? For example a Samsung A5 or an iPhone 6. Did you see an error message? If so, what was it? Where did you encounter the issue? For example when you purchased the App, or when using the Daily Program. What did you do before you encountered the issue? Which steps did you take? If you don’t have a specific issue or you want to provide us with some feedback, don’t hesitate, and just send us an e-mail. Good luck with the Untire app. We hope it will help you regain energy!